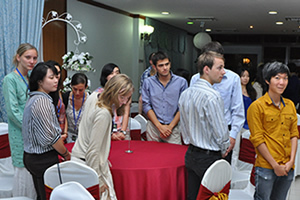 BANGI, 26 August 2012 – The National University of Malaysia (UKM) has been chosen by another foreign student exchange body to host its inaugural programme in Malaysia. 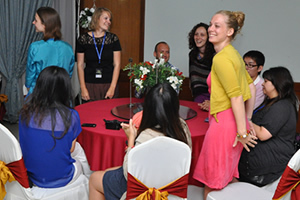 UKM is partnering the American Field Service (AFS) in implementing the inaugural Asia-Europe X-Cultural Summer Academy 2012, a summer academy for foreign students who wish to experience Malaysia’s multi-cultural environment. The programme starts from tomorrow (Aug 27) and will last till September 8. It is based on the Inter-Cultural Experience held annually at Karlsruhe, Germany. AFS is a non-profit international exchange organisation for students and adults that operates in more than 50 countries. AFS International supports and develops the AFS organisations worldwide. The first batch of 38 students are currently undergoing a programme jointly-developed by UKM’s Institute of Ethnic Studies (KITA) as well as AFS Malaysia. 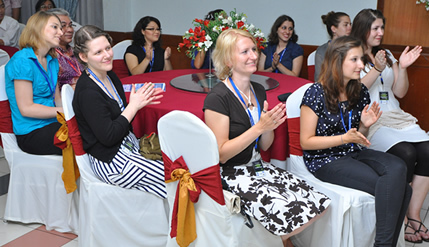 They were feted to a welcoming dinner by AFS at the campus here this evening. It was attended by UKM Vice-Chancellor, Professor Tan Sri Dato’ Wira Dr Sharifah Hapsah Syed Hasan Shahbudin; KITA Director, Distinguished Professor Datuk Dr Shamsul Amri Baharuddin as well as facilitators and trainers from AFS and the Karlshocchshule International University of Germany. Prof Sharifah Hapsah said that UKM has a proven track record in hosting international student exchange programmes, such as the Mobility International held every year. She said there are many similarities between the Cultural Summer Academy and the Mobility programme, which had just concluded last month for the 2012 session. She said both programmes combine experiencing university life at UKM and being involved with the true nature and culture of Malaysia. Distinguished Prof Datuk Dr Shamsul Amri called on the students to be open-minded about the exotic-nature of their host country as there can be no greater teacher than first-hand experience. AFS Malaysia Chairman, Datuk Mahadzir Lokman, who was an AFS participant himself in 1973 in America, said studies have shown that AFS exchange programmes can have a deep and far-reaching impact on the lives of participants. He said AFS has helped more than 400,000 students and young adults embark on journeys of personal growth through intercultural learning experiences. Participants develop new skills and gain a broader perspective on the world while building meaningful and lasting connections with the people they meet along the way. He said AFS participants benefit from becoming a part of the global AFS community – a network of people who share their passion for exploring foreign cultures and connecting with people of diverse backgrounds. The 38-student contingent are aged between 18 to 25 consisting of 21 Germans, four Malaysians, five Chinese, two Italians, two Thais and one each from Austria, Canada, New Zealand and Romania. They are based at the Dato’ Onn residential College and have their activities at the college, the Social Science and Humanities Faculty (FSSK) and will go on field trips outside the campus including visits to an Orang Asli settlement at Pulau Carey, Klang, a visit to the National Museum and a trip to Desa Mentari in Petaling Jaya to see how families live in high-rise buildings.